You can learn more about how to distribute HTML5 games on this page. Compilation is the name of the process that create all the files needed to distribute your game. 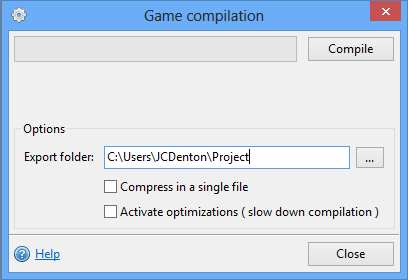 Open the project to compile in the editor, and click on “Compilation” button in Ribbon. Click on “Launch” so as to launch the compilation. The progress and a description of the task being made will be displayed in the window. When compilation has finished, GDevelop will ask you if you want to open the directory where the compiled game has been generated.